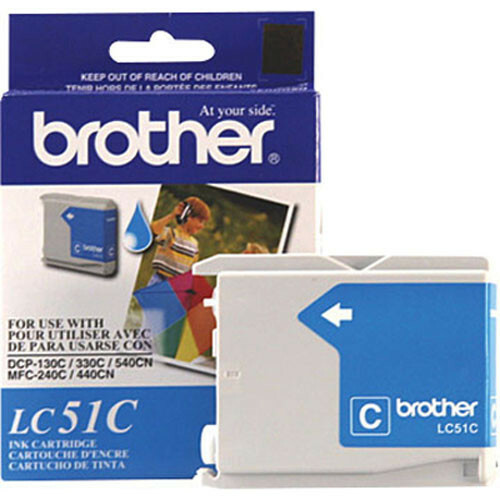 Revitalize your printer or fax with this LC51C Innobella Cyan Ink Cartridge from Brother. It features a yield of about 400 pages. Box Dimensions (LxWxH) 5.55 x 3.75 x 0.85"
LC51C Innobella Cyan Ink Cartridge is rated 4.5 out of 5 by 4. Rated 4 out of 5 by Anonymous from Quick and Simple Most of my printing is Word docs and pictures I download for reports. The quality of the ink is adequate, its easy to remove and replace each cartridge but the number of good prints I can get before replacing is about 50 pages. Therfore, the price is somewhat expensive. Rated 5 out of 5 by James from Genuine Product and Quick Shipping Item received was a genuine Brother ink cartridge that I prefer to use in my MFC machine. Since my order was shipped on the same day, I had my ink in a couple days.